Arthritis Drug New Baldness Cure? Unfortunately Not. In June 2014, researchers at Yale University reported startling findings: By using tofacitinib citrate (commonly sold as Xeljanz and Jakvinus), a drug used to treat rheumatoid athritis, the Yale research time was able to regrow scalp hair and body hair in a patient with alopecia universalis. Update: After publishing this article, a second study on alopecia areata came out, this time from Columbia University. They studied the effects of the drug ruxolitinib (brand name Jakafi) on alopecia areata, seemingly confirming the findings of the Yale team that Janus kinase (JAK) inhibitors prevent the immune system from attacking hair follicles. Like the Yale Team’s findings, the Columbia research deals with alopecia areata, an autoimmune disorder with a mechanism different from male pattern baldness, or androgenic alopecia. While this article was written concerning the Yale team and tofacitinitib citrate, it also applies to the Columbia team’s research with rexolitinib, as they are both JAK inhibitors. These panels show the patient’s head a) before treatment with tofacitinib, b) two months into treatment, c) five months into treatment, and d) eight months into treatment. Photo courtesy Yale University. This might make men experiencing hair loss ranging from a receding hairline to completely bald feel new hope for a baldness cure, and there may very well be a new cure for baldness on the horizon. While these results have certainly improved the quality of life of their patient, this isn’t it the cure for “baldness” that most are hoping for. Androgenic alopecia—male pattern baldness—and alopecia universalis are two very different conditions with one superficially similar symptom: Hair loss. 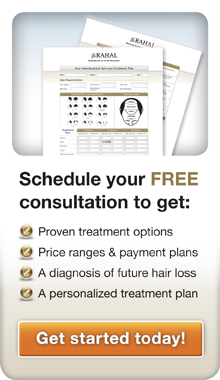 The differences lie in the both the mechanism of hair loss, the extent of it, and how these conditions are treated. Tofacitinib appears to spur hair regrowth in a patient with alopecia universalis by turning off the immune system attack on hair follicles that is prompted by the disease, the Yale team reported. There are currently no drugs on the market that can completely halt or reverse male pattern baldness. Finasteride and Minoxidil, commonly sold as Propecia and Rogaine respectively, can help slow and manage hair loss, but hair transplant surgery is still the only permanent solution to restore your naturally-growing hair. With male pattern baldness, genetics and hormones are the key factors in hair loss. Dihydrotestosterone, or DHT, is the primary driving mechanism in male pattern baldness. DHT is a potent form of testosterone. The hair follicles on the top of the scalp and at the crown are sensitive to DHT in men with male pattern baldness. Theories as to the reasons for male pattern baldness, and why those hairs in particular are sensitive, abound. One theory suggests that male pattern baldness might have evolved as a defense against prostate cancer. High levels of DHT can enlarge the prostate and lead to prostate cancer. The theory suggests that scalp hair began to fall out in the presence of DHT to expose more skin to direct sunlight. More sunlight means the body synthesizes more Vitamin D. People with low levels of Vitamin D are more likely than people with normal levels of Vitamin D to test positive for prostate cancer. Male pattern baldness, according to this theory, is the body’s way of defending itself. The Norwood Scale illustrates the stages of androgenic alopecia, or male pattern baldness. It’s what most people think of when they think “bald”. Alopecia universalis is a different story. Alopecia universalis is the most extreme form of alopecia areata (loss of hair in a single area of the body). Alopecia totalis, the loss of all hair on the head, is another form of alopecia areata. All forms of alopecia areata, including alopecia universalis, are believed to be autoimmune disorders. In the case of alopecia universalis, the body’s immune system attacks hair follicles the way it would attack a virus or an infection, causing the hair to fall out. Alopecia areata affects only about 0.1% of the population, or 1 in 1000. Alopecia universalis, its most extreme form, affects far fewer. Male pattern baldness, on the other hand, affects many men, if not the majority of men. A 1998 study suggested that as many as 42% of all men, or nearly 1 out of 2, will have Norwood Stage 3 male pattern baldness or greater. That doesn’t include Norwood Stage 2 and 2A. 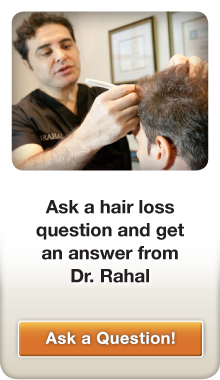 At Rahal, we see many men struggling with male pattern baldness. Some of our patients are women, for whom thinning hair can prove far more devastating, as well as patients who struggle with hair loss in certain areas of their body. We know how difficult a person’s body image can be when dealing with that. We can only imagine how hard it must be to lose all hair on your body, not just the hair “up top”. We’re absolutely thrilled with the results of the Yale researchers, who have given their patient the hope and new lease on life that we see in our hair transplant patients every day. We hope that their research continues to benefit others with this rare autoimmune disorder, but it is apparent that there will be no new baldness cure in 2014; at least not what most people imagine bald to mean. 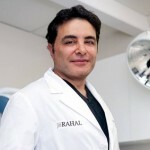 Meanwhile, at Rahal we remain committed to helping men and women achieve a permanent hair loss solution. “I WAS DEVASTATED” — Sam’s unsuccessful hair transplant in Montreal stopped him from enjoying life. Then he found Dr. Rahal. You’ve spotted your first gray hair: Now what?